Visit the world-famous Notre Dame of Paris, with a complete tour of its luxurious interiors and majestic exterior. Understand its deep historical and cultural impact on France and its people. Get a chance to see panoramic views of the city of love after you ascend the cathedral towers, having purchased your tower tickets with the help of your friendly guide! Savor the best of Paris, as you are taken on a tour of one of its best-known attractions, the Notre Dame. With a live commentary from a guide, bask in the deep-rooted history of Notre Dame. See the Notre Dame Towers and the city of Paris from a new perspective once you ascend to the top. This tour is hosted by an English speaking guide. You will meet your guide near the attraction, the Notre Dame. You will embark on a tour around it, as the host explains its long-standing tradition and the role it has played in the country of France over the years. The Gothic style of architecture presents an imposing, yet regal sight. The flying buttresses, spires, naves and innumerable statues add to its majesty and grandeur. The western facade of the cathedral shows the Portal of the Last Judgment, the Portal of St. Anne and the Portal of the Virgin. Each of them consists of a door ringed on top with some of the most intricate statues depicting the particular scene that is being portrayed. Witnessing the artistry and skill of these 14th-century sculptors and architects is breathtaking. The interiors of the cathedral are equally eye-catching, if not more. The famous rose windows are some of the most beautiful examples of stained glass artwork. It is a testament to the skill of the medieval craftsmen. Once you have toured the Notre Dame, your guide will bring you to the booths where you will be able to book the timeslot of your choice for a visit to the Notre-Dame Towers. If you need any help or assistance, you will be able to ask Notre Dame towers staff and your guide, however, rest assured, the tours are planned so as to allow you to be able to book an available timeslot. During the time slot you book at the booth, you will be allowed to ascend the 422-steps to the top. As you go up, you can see some of the hidden gems of the monument, including the several gargoyles that seem to come to life as you get closer to them. Stunning sights of the city and other monuments abound from the top and makes for a unique experience. 1-hour, 30-minute guided tour of the Notre-Dame Cathedral. 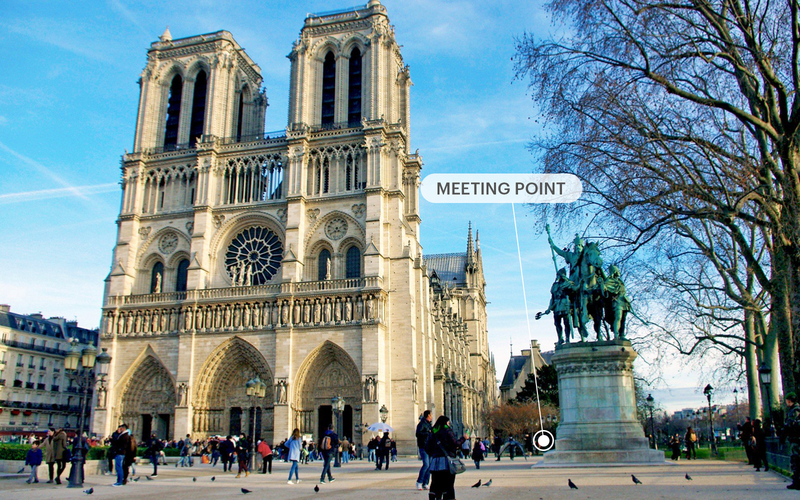 Self-guided tour of the Notre Dame Towers (optional). Small group with fewer than 20 people. History Group and Fast Pass Tours are not responsible for your Notre-Dame Tower's reservation and purchase. Please note that this tour does not include access to the Towers, and you will have to opt for it. The Notre-Dame no longer allows tour operators to pre-book tower tickets and, as such, you will have to book your slot for access to the tower. Your guide will bring you to the booths where you will be able to book the timeslot of your choice for a visit to the Notre Dame Towers. Of course, if you need any help or assistance, you will be able to ask Notre Dame Towers staff and our guide will be present also. Rest assured, we plan our tours so as to allow you to be able to book an available timeslot. Indeed, Notre-Dame Towers have put in place a system called "Je File", which allows for managing the Notre-Dame towers' access for individual customers. It's essential to use "Je File" to book your access to Notre Dame's towers. The booth you'll be brought to will allow you to do that. Our operators are not responsible for your Notre-Dame Tower's reservation and purchase. The tour begins at 10:00 AM from the meeting point. By Bus: Get off at Stop Cite Parvis Notre Dame using buses 47, N15, N22. Please note that the towers of the Cathedral require a 422 step climb and hence, this tour is not wheelchair accessible. These tickets cannot be canceled or rescheduled. Notre Dame was imposing , almost felt alive. Such a brilliant work of architecture, wish could spend more time. The tour was very good but it's very physically demanding, not for older people or people with accessibility issues. You will receive an email with your Notre Dame Cathedral Tour with Optional Tower Access voucher instantly. You may display the voucher on your mobile device with a valid photo ID at the meeting point to receive your physical ticket. You must meet your host in order to exchange the voucher for your tickets. Should you head directly to the Cathedral with your confirmation voucher, you will not be given entry. Please meet your host at the statue of Charlemagne located on the right-hand side of the forecourt facing the Notre Dame. Keep your mobile voucher at the ready. Your host will be carrying a blue sign with Headout written on it.